Our product range includes a wide range of din abrasion tester and abrasion tester. In order to successfully meet the diverse demands of the clients in footwear industry, we bring forth a precision designed array of Din Abrasion Tester. Built on rigid steel base and finished in grey metallic and bright chrome / zinc plating, these are designed to accurately determine abrasion resistance index of natural and synthetic rubber. 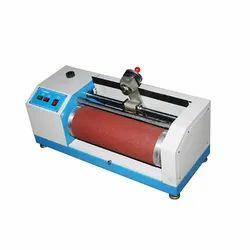 In order to successfully meet the diverse demands of the clients in footwear industry, we bring forth a precision designed array of Abrasion Tester. Built on rigid steel base and finished in grey metallic and bright chrome / zinc plating, these are designed to accurately determine abrasion resistance index of natural and synthetic rubber.